My wife and I recently got 10 Days in Europe and 10 Days in Asia, and after playing them individually, I'd been wondering whether the two games could be combined to good effect into one massive 10 days in Eurasia. We had our excuse to try this evening--we were playing 10 days in Europe with one couple of friends when another couple arrived and wanted to join. What to do? We put the two maps, Europe and Asia together, handed out two more sets of tile holders, and mixed all the Europe and Asia tiles together. As for variant rules, they mostly were pretty intuitive: Russia and Turkey on one map are the same as Russia and Turkey on the other (it makes it easy that they are the same color--by design no doubt), Mediteranean Sea cards from Europe allow access to Med locations in Asia (Syria, Lebanon, etc. ), Green Planes were Green Planes regardless of which game they came from, etc. We had only three face-up piles and started with one Europe tile and two Asia tiles face up. The only real restriction was that to win, one had to use at least three actual countries from both Europe and Asia. This rule was conceived totally arbitrarily and after a few bottles of wine had been consumed, and yet really seemed to succeed in making the game a challenge but not impossible. We played two games and both lasted until nearly all of the face-down tiles had been drawn. I had expected that the greater availability of planes might allow winners to go back and forth between Europe and Asia, but both of our winners started on one half of Eurasia and in the middle of their journey transitioned to the other. Our first winner took the unlikely vacation of Germany to Sri Lanka via North Korea. The second took a more conservative trip, dabbling in Asia before making a long drive from Russia to France. Both games were challenging and fun, and there's a good chance we'll try it again. In fact, I think we're going to order 10 Days in Africa so we can play 10 Days in the Eastern Hemisphere. Has anyone else tried this? Or has anyone tried 20 Days in Eurasia for 2-4 Players? Or 30 Days in the Eastern Hemisphere for 2-4 Players? Or 10 Days in the Eastern Hemisphere for 8 Players? The possibilities are mind-numbing. Tom Vasel has in a this review comments about playing "40 Days around the World" using all 4 games. Thanks for the link--we figured someone had already done something like this. We'll have to try 40 days around the world once we get Africa. Though I'm guessing 40 days for 2-4 players is a dramatically different experience than 10 days in Eurasia or Eastern Hemisphere with 6 or 8 players. 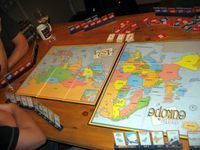 Not to say that the latter is the greatest strategy game, but it was a great wine, cheese and chit-chat backdrop. We have all four games and have done a variety of 20 day games, never longer. It tends to take a 30 minute game and turn it into a 90 minute game, and there tends to be some metagame aspects associated with being able to see the set a given drawn card is going to be from based upon the varied backs. Combining the two would work better with at least four discard piles. The "metagaming" aspect can be removed by taking the card from the bottom of the drawpile, rather than the top.